I left the bus at Limehouse Station - maybe it was the urge to get walking, or the curiosity which had managed to get the better of me? It's hard to say, but as I edged my way around the road crossings and under the brick arches which carry the railway and DLR overhead, I felt very glad to be back. I had half a mind to head for St.Anne's Church, with the lantern of Hawksmoor's tower glowering at me, stark white on the leaden sky - but I'd walked that way before and I knew that wasn't for today. Instead I wanted to skirt the river, striking a course across the top of the Isle of Dogs. My targets lay east of here, and the walk to get there wasn't planned or arranged at all - so I did what I always do, and headed for water. I've visited Limehouse Basin before - a fleeting circumnavigation during the summer of 2012 - but I'm curious to work around the perimeter again. Passing the lock which gives entry to the Regents Canal, I spot a curious statue on the skyline - Christ the Steersman looking out to the river and granting safe passage to sailors, or perhaps just regarding the tall crane which is building something to obscure his view? As I cross the entrance to Limehouse Cut I recall being harangued by a group of Spanish students here before. Today it's quiet, a solitary homeless man parked under the footbridge. Here I decide to take a route slightly inland, along Narrow Street and Limehouse Causeway. I'm curious to follow the straightest path here, to cut a swathe directly eastwards as far as I can. This is largely uncharted territory for me, and while I've flitted around the river fronts, this stretch of remarkably well preserved warehouses and wharves is a mixture of the charming and depressing - which so often sums up gentrification east of the city. Every authentically painted wooden door gives entry to either a range of utterly unaffordable loft apartments or a faceless media company - some buildings hosting both. Do people live 'above the shop' here like they did in the 18th century, I wondered as I passed Ropemaker's Field by way of a larger-than-life statue of a Herring Gull. Looking north, a development of low-rise public housing was dominated by two stark, grey concrete clad blocks - Malting House and Brewster House. I marvelled that, although I'd passed on the Docklands Light Railway many times, these blocks hadn't ever troubled my view south - no doubt dwarfed by the massive blocks of Canary Wharf in the near distance, the eye drawn involuntarily upwards. At this point, my route headed inland while the Thames turned sharply south. I followed the railway arches towards Westferry Station where the tangle of roads roared in the near distance. Again on instinct, I stayed south of the arches, edging along the railway which I knew took broadly the path I wanted to follow. For a while at least I was separated from West India Dock Road by a large fitness centre which dwarfed the grand Dockmaster's House and a quaint row of brick cottages, marooned in the glass and steel landscape which was now surrounding me. At the end of my path I noted the huge triangular DLR junction looming on narrow concrete viaducts. The various extensions and additions to the basic three-way pattern soared and dipped over the triangle giving a crazy sense of distorted geometry. The path ended at the cul-de-sac loop of Hertsmere Road. A black Mercedes was parked across the pedestrian access onwards, rear windows tinted, driver wearing sunglasses. I passed the car and edged around the rear to access the path. Clearly but inexplicably irritated he glanced in his mirror, started the engine and sped west with much noise and tyre-screeching. I emerged from the tangle of railway viaducts onto a path beside Aspen Way, the busy six-lane arterial which scythes across the top of the Isle of Dogs, taking traffic from the Limehouse Link tunnel to the Lower Lea Crossing. It was moderately busy, providing a shrill metallic soundtrack to this part of the walk. I crossed the entrance to the Canary Wharf development - a permanent security checkpoint, manned by uniformed guards in Police-grade stab-vests. The guard was busy instructing a wayward wanderer in how to get back to civilisation when I passed, and I couldn't help suspecting I'd have got the same treatment had he not been busy. Shortly after crossing the entrance, a marine aroma announced Billingsgate Fish Market. This 'new' site, no doubt chosen back in 1982 for its relative distance from polite city life was now nestled at the foot of banking towers and expensive apartment blocks. It presented a strangely swift transition to the ragged margin of the Isle of Dogs, the development suddenly petering out into wasteland carparks and recession-paused building projects. Over it all, One Canada Square and its sister blocks glint and reflect the view back at the pavement. There was no-one around on a grey, windy Saturday morning - neither banker nor fishmonger - which just made it all feel even stranger. Here I had to brave a complicated road crossing, feeling thankful for the sudden eerie quiet which descended on the street once I'd passed the Market. Diving under the flyover I emerged not far from where my previous walk had begun on Poplar High Street. Once again skirting the bulk of Robin Hood Gardens, I found myself disappearing between the undistinguished buildings of the East India Dock Development - an enclosed loop of buildings, turned inward for protection from the flailing economy of the early 1990s. The Borough of Tower Hamlets has leased part of this complex at tremendous public cost almost since it was built, and no-doubt still will unless their ever-wayward Mayor gets to realise his ambitions for the former Royal London Hospital buildings. The streets hereabouts all bore the names of spices - the stock-in-trade of the East India Company - and the area still had the feel of being held in bond. Lifting gates and security kiosks bookended a bus stand, the vehicles allowed through under sufferance. I tried to look as innocuous as possible as I stalked purposefully along Saffron Avenue, a rank of gently ticking 277 buses resting, their drivers relaxing in the deserted calm of this spot at a weekend. Emerging onto the public highway at a large roundabout, I spied a service station up ahead. I was hungry and thirsty - ever aware that my decision to start my walk further west meant I'd yet to even begin to achieve my goals. I ducked across Silvocea Way, passing the mighty red brick dock walls which marked the site of the former Pepper Warehouses, and entered. It was a strange amalgam of convenience store, urban coffee outlet and filling station which appeared to expect customers to pay for different commodities at a series of different checkouts. I made the simplest circuit that I could to obtain coffee and food, and retraced my steps to the Dock Walls, disappearing through the portal flanked with the emblems of Mercury, protector of merchants and tradesmen. At last, a broad, open view across Bow Creek greeted me. It was time to rest and take stock of my walk so far. After a brief detour to view the dramatic curve in the river here, I pressed on. My first objective was just across the water, but was still a short walk away along the river path. The west bank of the Lea has been improved here - a wide expanse of footway, benches and lamps edge north towards a tangle of bridges - but the scheme is unfinished. This abandoned attempt to make the river walkable to its mouth would return to confound me again and again today. Not even the mighty juggernaut of the Olympics or the seemingly omnipotent reach of the LLDC seems able to push this project forward. What has been built though is the 'blue bridge', or more formally the Jubilee Footbridge. 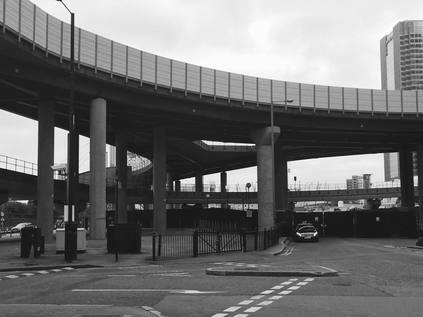 This stocky, imposing crossing is a little lost between the ghosts of other crossings and the massive road scheme which takes the A13 over to Canning Town, and as a result it has a curiously abandonded feel too. Litter drifted across the path, and the ominous sign told me that there was a "Pollution Control Valve" nearby if required. South of the bridge, the old iron railway swingbridge remains intact but decaying. I wondered why it wasn't pressed back into service to get walkers onto the peninsula rather than building a new bridge? North of the blue bridge, the road bridges swung away to the north east a little - an impressive iron structure from 1935 sandwiched between two concrete slip-roads and bus lanes commissioned by the London Docklands Development Corporation. Descending towards the park I noticed an elegant sweep of red brick with a steep slope down to the bank - one of the abutments of the 1896 replacement to the original 'Iron Bridge' which carried Barking Road over the creek remains here, sandwiched between new crossings, filling with litter and looking forlorn and forgotten. I marvelled about this tiny reminder of the past importance of this spot, left to obscurity here. 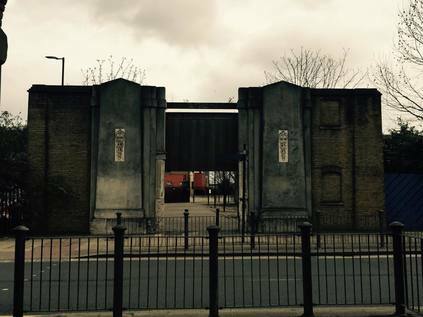 Turning south, the gates of Bow Creek Ecology Park were before me. This tongue of land, pinched by the bulging turn in the river, had been given over to nature once the DLR viaduct had been completed, and was now open as a public park. It was, predictably, deserted. A DLR train descended from the viaduct, touching ground just feet from where I stood - the disinterested faces of the passengers on board looking blankly back at me. I walked the well-kept path around the loop, seeing places I'd already walked from new perspectives across the water. The overcast skies broke a little and afforded me some sunshine too. On the eastern side of the park, a view across to the City Island development showed progress - with the new, red, high-level footbridge in place but not commissioned up ahead. I reached the end of the path. A footbridge carries a path over the DLR here from the entrance of the Ecology Park to the eastern side of the tracks, but the way forward was barred by railings. I surveyed the footbridge, wondering if doubling-back and taking that route would get me further, but in the distance I could see more barriers near the new high-level bridge. Once again I cursed the lack of a continuous walkway along the bank. Forced to retrace my steps, I pressed on past the blue bridge and walked along the road access to the park. The DLR swoops upwards here to reach a former railway alignment, and Wharfside Road passes under it in a spot I think I can declare the worst place in London bar none. As the underpass is too low for vehicles, the road travels in a hollow channel dug deep between two raised footpaths. This gives the pedestrian a dark, claustrophobic experience, hemmed in by railings and roof, with the echoing chasm of the road beneath. The whole area is a swirling trap of litter and dust. Dumped chemical barrels and the ragged remains of rough-sleeper's bedding are strewn across the path. The opposite pathway is perhaps worse, stopped off at one end by railings, it is an even more popular haunt it seems with syringes and special brew cans littered across the concrete plinth. But worst of all, it is oddly, eerily silent here between passing trains. The remoteness and deserted nature of this spot is no doubt its attraction for many of its regulars, but right now it was perhaps fortuitously empty of any obvious signs of life. I moved on hurriedly, out into the dusty mess of Stephenson Street, running alongside the Jubilee Line. I'd seen this long, straight stretch of road from the train many times and wondered about it - particularly the Durham Arms. 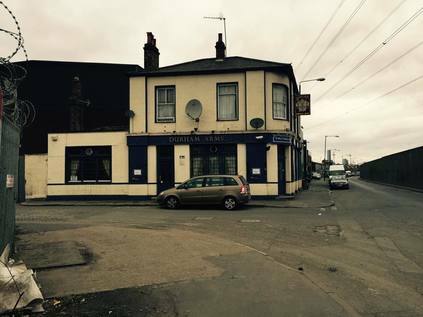 An apparently closed, crumbling traditional pub which sat among factories and makeshift corrugated iron yard fences. Clearly older than most of its surroundings it must once have been busy with dockers and local workers, but now it was marooned between river and railway. Amazingly though, it was still open. Through the grimy, stippled glass windows a dull light glowed. A notice threatened dire consequences for incorrect parking, and another suggested - as I skirted an inflated and bursting steel drum of some sort of foaming chemical dumped on the path - that I try the beer garden at the rear! I didn't, but looking into the history of this place later, I almost wish I had. Linked to the shady past of the area, once owned and operated by the Sabini Gang, and later operated by the Metropolitan Police to front a secret corruption investigation, this was far from an ordinary boozer. The only traffic here was a constant stream of "out of service" buses thundering in and out of the nearby depot. As I paused to look along the long, dusty line of the street, a bus halted beside me and the door opened "Are you lost mate? I can take you back to the main road if you want". I was almost tempted, this wasn't somewhere to linger. But I had further to go yet. At this point, things began to get frustrating. My feet had entered the strange zone which all urban walkers will know - where stopping was advisable, but starting again would be unlikely. I'd noted a range of possible footpaths to the river, linking Cody Dock with Twelvetrees Crescent, but the map was unclear on whether there was a way through. This whole stretch of the Lea was to be linked to Stratford by "The Fatwalk" - a shared pedestrian and cycle facility - in a plan dating back to before the Olympics. The games briefly re-energised the plan, and bits of the route have appeared, but crucial chunks are missing. The project is now once again shelved, and as a result I found myself picking my way around an industrial park, deserted save for a young eastern European couple who clearly had hoped to find privacy and were mildly annoyed to find me lurking. The businesses here were a little more salubrious than those I'd passed on Stephenson Street, mostly large national or multinational outfits. After what seemed like an interminable walk between these vast prefabriacted warehouses, I found the gates to Cody Dock resolutely locked. This is an interesting spot - a social enterprise has secured ownership of a small dock which branches off the Lea nearby, and runs projects and events on the premises. They hope to raise money to replace a bridge over the dock to link with the very path I wanted to access. But today, no chance of getting through to even see the progress. I retraced my steps and turned north into the Prologis Distribution Park, passing a deserted security check to enter. This was another odd space - apparently public, with bus stops and pathways through, but assuredly private as the Security Office and uniformed guards made sure passers by were aware. I walked through the park to reach its north eastern extremity, where there was the suggestion on the map of a path running beside Abbey Creek and the Channelsea River. Once again, I found my way barred by a semi-permanent fence. This was becoming all too predictable. Again retracing my steps, I caught sight of the statue of Sir Corbet Woodall surveying the towering gasholders which his company had built from a pleasant little woodland nook in the midst of all this industry. Thwarted again, I headed west, crossing the Lea at Twelvetrees Crescent where on a previous walk turned back because of the security presence, assuming there was no public right of way over the river. From the middle of the bridge, while looking over at Bow Locks, I spotted the pleasant, riverside walkway along the eastern bank which had been constructed as part of the planning gain for the nearby new industrial units and which would, if the plan ever came to fruition, link Cody Dock with Twelvetrees. I didn't have the heart to walk that dead-end today - there had been one too many frustrations to my progress already. On more familiar territory now, I figured it was time to use my local knowledge a little. After a visit to the supermarket, I returned to the river at Three Mills, pausing for refreshment and a rest. As I sat, unkempt and fatigued, poring over my 1972 A-Z for clues, a group of senior walkers turned up and sat nearby. All greying, but bursting with almost indecent fitness and well-being, they carried all the appropriate gear - modern maps, good boots, spiked walking sticks and a sensible packed lunch. As I furtively fished in my Tesco bag and tried to make sense of the map which was the same age as me, I felt them looking at me with curiosity, maybe a little distaste and perhaps some pity. It was time to move on. I turned east again, onto Three Mills Island, in the hope of either finding a path around the back of the House Mill and turning towards Abbey Creek, or crossing the Prescott Channel at Three Mills Lock and picking up the Long Wall path. Both seemed unlikely - the path around the mill was stopped-up at its entrance, so I crossed into the pleasant but quiet park and walked to the lock instead. The bridge here had been closed when I first visited in 2012, and remained so. Across the water, work continued on the Lee Tunnel which seemed to be taking forever to complete. Getting somewhat used to finding the way blocked now, I recalled the route I'd taken along the Three Mills Wall River through the little residential estate to the Greenway, and decided to follow that. Today though I headed under the sewer and into Abbey Lane, passing a row of attractive workers' cottages, now relatively cut-off and sleepy since the road was severed. Here the continuation of Abbey Lane swings right, heading back towards Abbey Creek. With the impressive towers of the Victorian pumping station on my right I headed along the strangely busy road to a tight curve with a bridge parapet on one side. Crossing the fast-flowing stream of traffic and perching on the tiny sliver of pavement behind the crash-barrier, I looked over into the remains of the Channelsea River. In fact, long before I saw it, I could smell it. The combined odours of a long-since stopped up river and a major sewer flowing overhead just feet away were pretty overpowering. The Lee Tunnel works haven't only affected the Long Wall path it seems, with the Greenway also closed between the two points. The sewer, scaffolded and plastic-sheathed, shadowed the mud, silt and filth below. The Channelsea is gone. A ghost of a river, filled in in the 1970s, and now I wanted to walk the path which had been laid on top. I'd finally found my second goal. The Channelsea Path, although I'd walked a long way and taken a ludicrously convoluted route to find it, was a pretty unremarkable walkway. From its terminus on Abbey Lane, in less complicated times it should be possible to ascend to the Greenway, or even join the path to Three Mills via the Long Wall. But for now it comes to an abrupt halt here at the busy curve in the road, Disappearing between trees, it follows the line of the street initially, with the Jubilee Line's Stratford Market Depot fanning out in the space between the former river and Bridge Street. Soon, with the road giving way to the back of large industrial units, all is quiet. The former river walls, green with moss and dotted with occasional ironwork appear on what would have been the western bank. A tiny brown rat scampers out into the path and eyes me suspiciously, before scampering into the undergrowth and shadowing my walk - presumably hoping I'll drop some scraps or litter, as it seems many have before me. Otherwise I'm alone, walking slowly but purposefully, occasionally stopping to investigate the fading public art or the information boards which are still just about readable, giving context to this path and its history. Sooner than expected, I find myself deposited into a new development of homes, just off Stratford High Street. I've survived another excursion off the map, and I'm back in civilisation almost sooner than I'd hoped. After a brief coffee stop in the colourful, dizzying whirl of the Stratford Centre, I hopped on a bus back west for a final quest. Someone had tipped me off about the location of some graffiti related to saving bees, and I was keen to see if it had survived over-painting. I disembarked at the East London Mosque and crossed the street onto a narrow strip of pavement created by the Cycle Superhighway improvement work. Fighting my way along the contested path, I finally turned into Osborn Street and made my way along an equally difficult-to-navigate Brick Lane. I somehow always feel like I'm walking against the crowds here, so I wasn't sorry to duck into the alley leading to the old Shoreditch Tube Station where I knew there was a fair amount of street art. 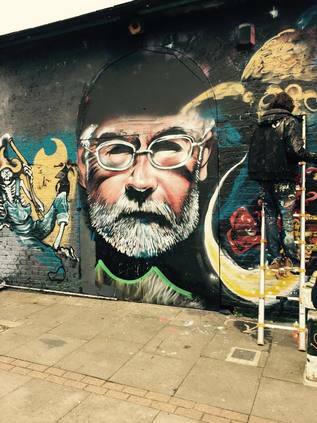 No bees this time, but a chance to watch some artists working on a memorial to Sir Terry Pratchett which was taking the entire wall of the former station. Back on Brick Lane, I dipped into a bookshop to buy a card before again leaving the fray for the backstreets around the newer Shoreditch High Street station. Here I found where the bees had been, but alas new work had overwritten the landscape. The vacant plots of the former Goods Yard were fenced off and parcelled up for development now, and it clearly wouldn't be long before this sort of thing became more public nuisance than public art. Finally, after a day of idle threats, it began to rain at last. It was time to duck into Liverpool Street station and begin the journey westwards, and towards home.